Who makes the news in a digital age? Participatory Journalism offers fascinating insights into how journalists in Western democracies are thinking about, and dealing with, the inclusion of content produced and published by the public. David Domingo is a senior lecturer in online journalism at the Department of Communication Studies of Universitat Rovira i Virgili in Tarragona, Spain. Domingo, who has a Ph.D. in Journalism from the Universitat Autònoma de Barcelona, was a doctoral fellow at the University of Tampere (2004) and visiting assistant professor at the University of Iowa (2007-2008). His research interests include online journalists' professional ideology and work routines, as well as the dynamics of innovations such as participatory journalism and convergence. He is co-editor, with Chris Paterson, of Making Online News: The Ethnography of New Media Production (Peter Lang, 2008). Ari Heinonen, Ph.D., is journalism teacher and researcher in the Department of Journalism and Mass Communication at the University of Tampere, Finland. A former newspaper journalist, he has focused his academic research on explorations of the changing nature of professionalism in journalism, concepts of journalism in the new media era and journalistic ethics. He has directed and participated in a number of national and international research and development projects in these areas. Alfred Hermida is a digital media scholar, journalism educator and online news pioneer. Since 2006, he has been an assistant professor at the Graduate School of Journalism at the University of British Columbia, Canada. Hermida was a Knight-Wallace Fellow at the University of Michigan in 2005 and an IBM CAS Canada Research Faculty Fellow in 2010. An award-winning journalist who served for four years as a Middle East correspondent, Hermida is a 16-year veteran of the BBC and was a founding news editor of the BBC News website in 1997. He has also written for The Wall Street Journal, The Times of London, The Guardian and NPR. Steve Paulussen, Ph.D., is a part-time lecturer in journalism studies at both the Vrije Universiteit Brussel and the University of Antwerp, as well as a senior researcher at the IBBT research group for Media & ICT (MICT) at Ghent University, Belgium. In recent years, he has participated in a number of projects on different aspects of today’s digital media culture. His main research interests lie in the field of journalism studies, where he has published on developments in online journalism, newsroom convergence and the sociological profile of professional journalists. Between 2006 and 2010, he also was involved in a multi-disciplinary strategic research project on digital news trends in Flanders, Belgium (FLEET). Thorsten Quandt, Dr. phil. habil, is a professor in Communication Studies / Interactive Media and Online Communication at the University of Hohenheim, Germany. He has served as chair of the Journalism Studies Division in the German Communication Association (DGPuK) and as an officer in the Journalism Studies Division in the International Communication Association (ICA). His widely published research includes studies on online journalism, media evolution, network communication and computer games. Jane B. Singer is an associate professor in the School of Journalism and Mass Communication at the University of Iowa, USA, and a visiting professor in the School of Journalism, Media and Communication at the University of Central Lancashire, UK. From 2007 to 2010, she was the Johnston Press Chair in Digital Journalism at Central Lancashire. Her research explores digital journalism, including changing roles, perceptions, norms and practices. Before earning a Ph.D. in journalism from the University of Missouri, Singer was the first news manager of Prodigy Interactive Services. She also has worked as a newspaper reporter and editor. Zvi Reich, Ph.D., is a former journalist and a researcher in journalism studies at the Department of Communication, Ben Gurion University of the Negev, Israel. His book, Sourcing the News, was published by Hampton Press in 2009. Reich's research interests focus on online news, sociology of news, the relations between reporters and sources, authorship in journalism and the use of communication technologies in journalism. Two of his papers have won the top three papers prize of the Journalism Studies Division at ICA. Other research has appeared in Journalism Studies, Journalism & Mass Communication Quarterly and Journalism. He is a member of the editorial board of Journalism Practice. Marina Vujnovic, Ph.D., is an assistant professor at Monmouth University, USA. Her primary fields of research are participatory journalism and new media studies, media history and gender, critical political economy, and cultural studies. Additional research interests include international communication and the global flow of information, as well as ethnicity and the media. She is the author of Forging the Bubikopf Nation: Journalism, Gender and Modernity in Interwar Yugoslavia (Peter Lang, 2009). Chapter 1: Introduction: Sharing the Road. Part I: The Impact of Participatory Journalism. Chapter 2: Mechanisms of Participation: How audience options shape the conversation (Alfred Hermida). Chapter 3: The Journalist’s Relationship with Users: New dimensions to conventional roles (Ari Heinonen). Chapter 4: Inside the Newsroom: Journalists' motivations and organizational structures (Steve Paulussen). Chapter 5: Managing Audience Participation: Practices, workfl ows and strategies (David Domingo). Chapter 6: User Comments: The transformation of participatory space (Zvi Reich). Part III: Issues and Implications. 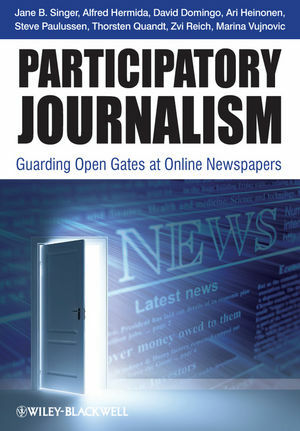 Chapter 7: Taking Responsibility: Legal and ethical issues in participatory journalism (Jane B. Singer). Chapter 8: Participatory Journalism in the Marketplace: Economic motivations behind the practices (Marina Vujnovic). Chapter 9: Understanding a New Phenomenon: The signifi cance of participatory journalism (Thorsten Quandt). Chapter 10: Fluid Spaces, Fluid Journalism: The role of the "active recipient" in participatory journalism (Alfred Hermida). "Like its authors, half of whom are both journalists and scholars, the book is also a hybrid - on the one hand, it serves as a robust piece of empirical research and, on the other, it is an excellent textbook for journalism students. This is evidently a deliberate device by the authors who wish to make a contribution to knowledge without alienating potential readers. The book is written in clear, familiar English resembling more of a journalistic style than an academic one, and each chapter ends with questions inviting the reader (or lecturer) to discuss and probe issues. There is also an effective glossary which explains terms which may be unfamiliar to those starting out in the field."